In this Age of Distraction who cares what anyone thinks? We are a long way from Michel de Montaigne, the first and greatest blogger. Why bother with yet another web-log? Good question! Who is this person? How does the reader abuse the author for being a pretentious fool? What’s the significance of the graphic? What software is supporting this mental flatulence? Why the weird name? Andrew Donovan-Shead goes disguised as a systems engineer with intention to become an independent consultant in the contemplative tradition of interesting problems. He sends and receives email via awd.shead@gmail.com. 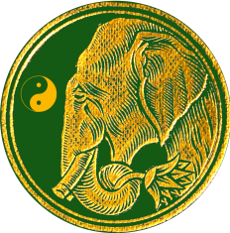 The elephant is reputed to never forget; meditation will improve memory through reduction in stress. Mahouts who train elephants found that they could never train the trunk which was forever questing in search of interesting things to smell or eat, which is particularly annoying when passing through markets where vendor’s produce is at risk. Eventually, a mahout discovered that the trunk is still when given something to do like holding a stick, or as in the logo a lotus blossom. And so, in meditation you use a mantra to help still your ever questing, racing mind. The Yin-Yang symbol of the I Ching reminds us to acknowledge change, that life is cyclical, that balance is essential, and that good coexists with bad. Life may be bleak at present, but eventually things will change for the better. It is a symbol of hope for better and a reminder that all good things end in time. Empires rise and fall. What goes around comes around. Symbolic of enlightenment is the lotus. It reminds us that the path to enlightement is a life-long journey. Enlightenment is really a better understanding of the self and the world in which one lives and of the actions one takes from moment to moment. This blog is hand-coded in HTML5 and CSS3. It works well with modern browsers like FireFox. If you are reading this with an antique browser then you could be out of luck. Do yourself a favour and upgrade to a modern web browser; FireFox is a free download. Cloistral is an adjective suggesting the quiet seclusion of a cloister where one goes to meditate and think. Notice the simplicity of the web-site, devoid of any fancy programming or flashy effects. Notice how easy it is on the eye. It is designed to be easy to read and to load quickly on any device. Simplicity and tranquility are what it’s all about, where the reader has a chance to quietly interact with the text undistracted. You are free to use anything appearing on this blog originated by the Owner-Author. Content created by the Owner-Author is entirely open and available for use by others in whatever manner others see fit. However, Users may only attribute text to the Owner-Author that remains an exact copy of the original; any deviation from the original wording releases the Owner-Author from any responsibility or consequences whatsoever arising from alteration, lost context, and republication. I am richer than all the billionaires put together; a sufficiency makes me rich beyond any dreams of avarice. Though I don’t need the money, it is a useful tool for expressing appreciation. Talk is cheap, hence the absence of reader comments, leaving you free to move quietly onwards to more congenial pages. 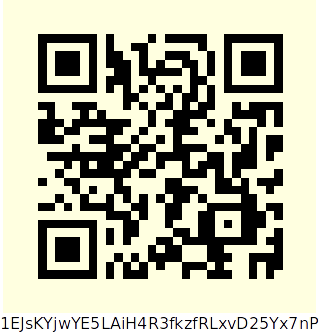 If you happen to find something on this web-site that tickles your fancy or is otherwise of use then you can express your degree of approbation by sending some small fraction of coin to me via the BitCoin address shown at left. You can zoom your browser to magnify the QR-Code as required.